Welcome to the new Undergraduate Student Affinity Group! USAG is an international community of students studying geography, offering opportunities to network and socialize, get advice on graduate study and careers, and take part in academic events. Undergraduate students from any college or university who are studying geography or closely related subjects are welcome to join. 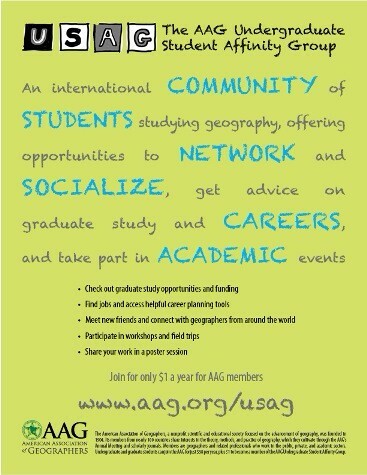 Undergraduate students can join the AAG for just $38 per year and receive a range of member benefits including online access to scholarly journals and publications, exclusive access to the Jobs in Geography listings, and reduced rates for Annual Meeting and other event registration. Joining USAG only costs an additional $1 per year. Copyright © 2013 Association of American Geographers. All rights reserved.